Bethesda 365 » Day 23: Let's Get Eating Bethesda! Day 23: Let's Get Eating Bethesda! In 1992, the Democratic National Convention was coming to New York City. In anticipation of the big event, some clever restaurant owners in New York City partnered with the convention bureau to offer the attendees a special welcome in the form of “Restaurant Week.” They banded together to share the promotional and advertising costs for the event, offering a fixed price meal at any of the participating locations to entice the attendees to try their culinary delights. Restaurant week was a huge hit not only with the convention attendees but with New Yorkers themselves and as a result, the tradition has continued and expanded to this day. Now you can experience the phenomenon in many cities throughout the U.S. – including Bethesda of course. This week, January 24 – 30th, is restaurant week in the Bethesda-Chevy Chase area. With almost 200 restaurants in our town, Bethesda is known for its diverse array of culinary experiences. People come from all over the greater DC area to dine here (one of the reasons our parking garages are absolutely nuts in the evening, especially on Friday and Saturday nights). Bethesda restaurants reflect the mixing pot of cultures you find in its residents and you can have some truly unique food experiences here. Brian and I enjoy eating – perhaps far too much! So restaurant week is a great excuse for us to try a new restaurant or to frequent one of our regular haunts. As such, we plan to feature a restaurant a day this week on Bethesda365.com – bringing you our tips, reviews and thoughts on some of our favorites amongst those participating. Please feel free to add your comments or suggestions too! 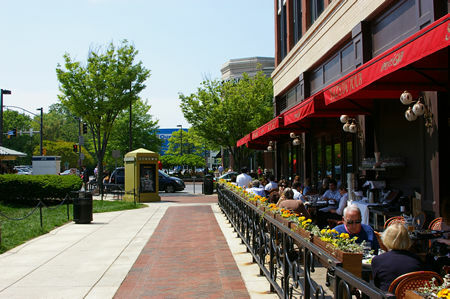 In 2011, over 35 Bethesda restaurants are offering a 2-course lunch menu for $12 – $15 and a 3-course dinner for $30 – not including beverage, tax or tip. Don’t forget to make a reservation AND check on whether your meal of choice has a fixed price meal option available. Some restaurants only offer the pre fixe meal option for either lunch OR dinner, but not both. For a complete list of restaurants visit the BUP (Bethesda Urban Partnership) website. This entry was posted on Sunday, January 23rd, 2011 at 7:00 am and is filed under Restaurants, Videos. You can follow any responses to this entry through the RSS 2.0 feed. You can leave a response, or trackback from your own site.